Heat oven to 350°F. Spray 11x7-inch (2-quart) glass baking dish with cooking spray. In 12-inch nonstick skillet, cook beef and onion over medium heat 4 to 6 minutes, stirring occasionally, until beef is thoroughly cooked; drain. Stir in baked beans, kidney beans, great northern beans and barbecue sauce. Heat to boiling, stirring occasionally. Pour into baking dish. 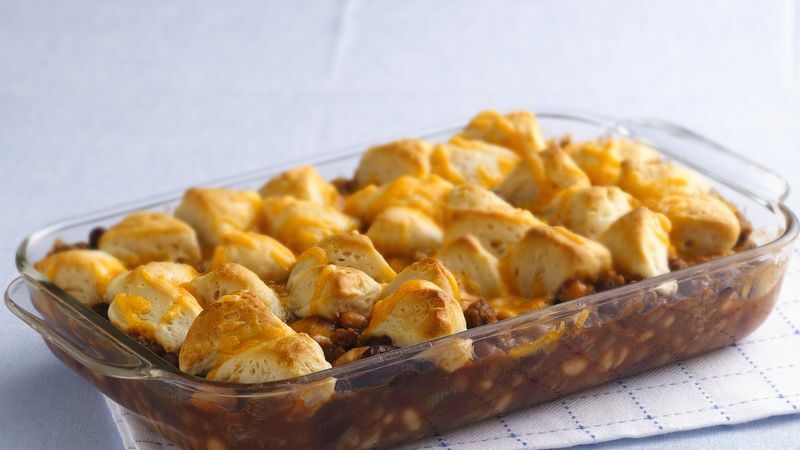 Immediately top hot mixture with biscuit pieces. Sprinkle with cheese. Bake 18 to 20 minutes or until biscuits are golden brown and baked through. For extra flavor, stir in 1/2 cup cooked bacon bits. Finely shredded cheese is a great way to extend the cheese in a recipe, although regular shredded cheese can be used.